In the 1950s and 1960s, activities such as horseback trail riding, skiing, snowmobiling and taking a day hike were among some of the popular choices among outdoor enthusiasts. While these are still enjoyed, people have been leaning toward less vigorous physical activities since that time, according to H. Ken Cordell of the U.S. Forest Service. Yet incorporating physical activity into your leisure and recreation activities is an ideal way to fit more exercise into your schedule -- as well as address your mental wellness. 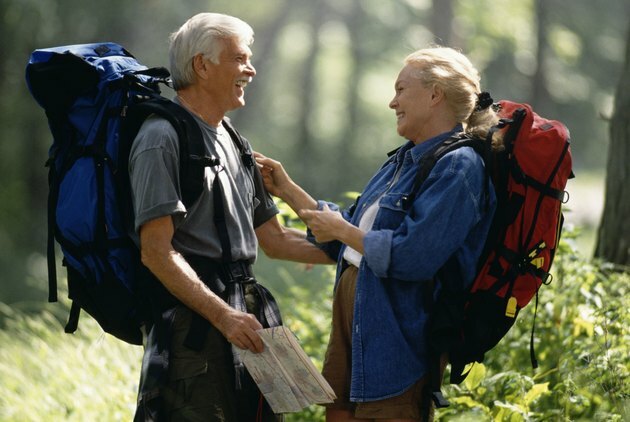 Taking part in recreational activities, particularly outdoors, can improve your physical wellness. In fact, people who frequently take advantage of park activities have fewer doctor visits, lower body mass indexes and lower systolic blood pressures than those who don't, according to Dr. Laura L. Payne of the University of Illinois. A 2005 California State Parks report also highlights that outdoor recreation provides an excellent opportunity to increase exercise. It cites a 2001 study revealing that the availability of recreational facilities in a location impacts the amount of physical activity in which residents participate. Mental wellness is an important part of your overall health and can impact your physical well-being. Participating in leisure and recreation activities can help you better manage stress and reduce depression. Leisure provides you the chance to find balance in your life; it also puts you in control of how you're spending your time, which is an important consideration because you may feel overwhelmed by obligations. Taking part in leisure activities as a family is also beneficial for your kids because you're modeling healthy ways to handle stress and emotions. Participating in leisure activities regularly reduces depression; in fact, just thinking about past outdoor recreation experiences can improve mood, according to the 2005 California State Parks report. Finding balance is also a reason why leisure and recreation can enhance your quality of life. Physical recreation, in particular, is associated with improved self-esteem. In addition, you're more likely to feel satisfied about your life when you regularly take part in recreation activities. This has significant implications for your mental health and, in turn, your physical health. In fact, 90 percent of respondents in a 2000 American Recreation Coalition study reported being satisfied with their health and fitness. In contrast, 60 percent of those who didn't take part in such activity reported not being satisfied with their health and fitness. All of these health benefits explain why recreational therapy can be such an essential part of a rehabilitation program. This type of therapy involves using various recreation or leisure activities to enhance or promote wellness. The American Therapeutic Recreation Association shines a spotlight on some of the benefits for the populations that commonly take advantage of the therapy including psychiatric patients, recovering addicts, children and seniors. Some of these benefits include faster healing from medical conditions, stress management, improved body function and better cognitive function. University of Illinois Extension; Community and Environmental Benefits of Parks and Recreation; Laura L. Payne, Ph.D.